Just as soon as I could see grass in my front yard mother nature decided to cover it up. We got two inches of the white stuff last night, but it won't last long with rain and above freezing temperatures in the forecast. 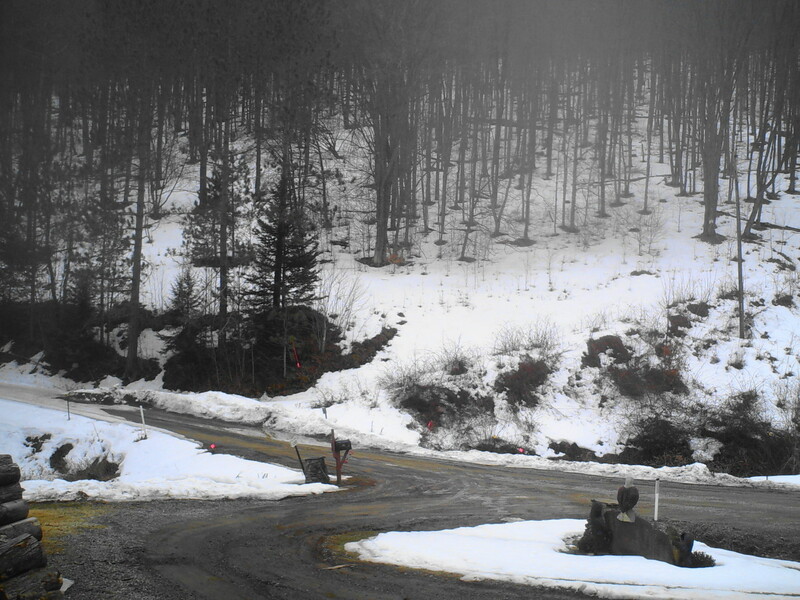 Lee Stover took the grader down Leetonia Road to Mine Hole so there are no deep spots of snow to that point. He did say he hit some pretty bad spots and you should watch out for any ice that hasn't melted. I am off to work to finish up painting my exterior siding and trim boards and work on putting up the ceiling tile. Mountain girl, Paula, logging out. My favorite place is our cabin in Leetonia. It is my favorite place because I can do almost anything there. As I lay in the grass during the summer, I smell a rich, piney, fragrance throughout the forest. I hear the stream gurgling as it swallows the rocks. All I see around me is luscious green grass covering the ground like a blanket. The cool green grass tickles my toes. Damp mist drenches my body. Velvety leaves rustle when the wind rushes by. In the winter I sit on the sofa in front of the fireplace that is crackling and popping. The trees around us are covered in a white dusting of snow. The smell of burning pine needles floods the cabin as the rich hot cocoa I am drinking burns the back of my throat. 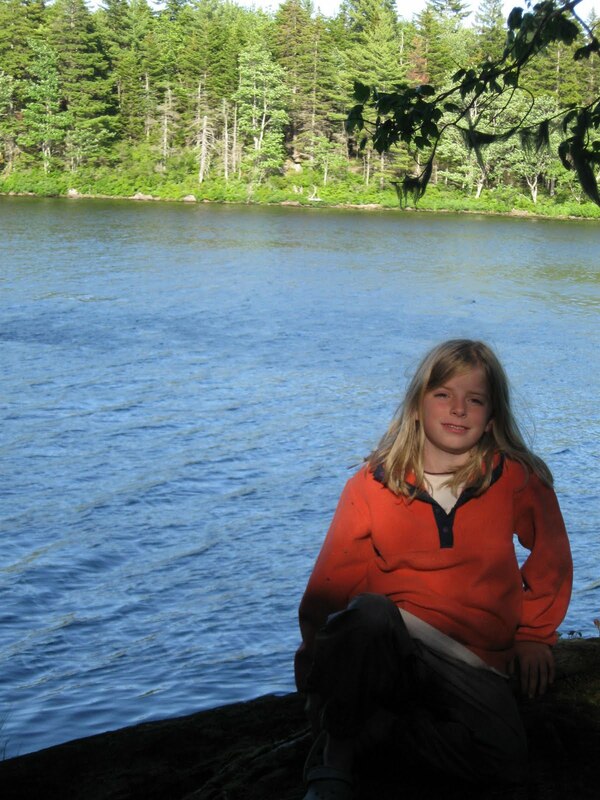 Now I think you know why our cabin is my favorite place to be. Thought you would all enjoy this 4th grader's opinion of Leetonia. I can remember being up here at that age and crying when I had to go home. Thanks for sharing Avery. Mountain girl, Paula, Logging out. Well things are moving along with the school house project. The walls are all done. The slate board is back up and I am putting in the suspended ceiling. It is difficult working around all the stuff in building seems I spend much of my time moving things. 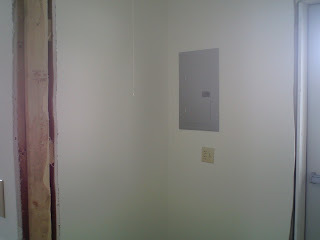 When ceiling is completed, I will be doing caulking and nail hole filling. I will also be starting to paint the siding boards and the exterior window trim inside as it is still too cold to paint outdoors. The high tomorrow will be 36 and the low 21, that is an upgrade from the low teens we have had for lows the last few days. colored flakes in it for floor. There isn't many products that can withstand the changing temperatures and lay on a less than flat floor. Vinyl would have been an option except the school desks cast iron feet would tear it up. So after the ceiling, I will probably be crawling under the school house to check supports for floor. I am sure more will need to be added. I am hoping we get some warmer weather soon as much of my next work will be outside. 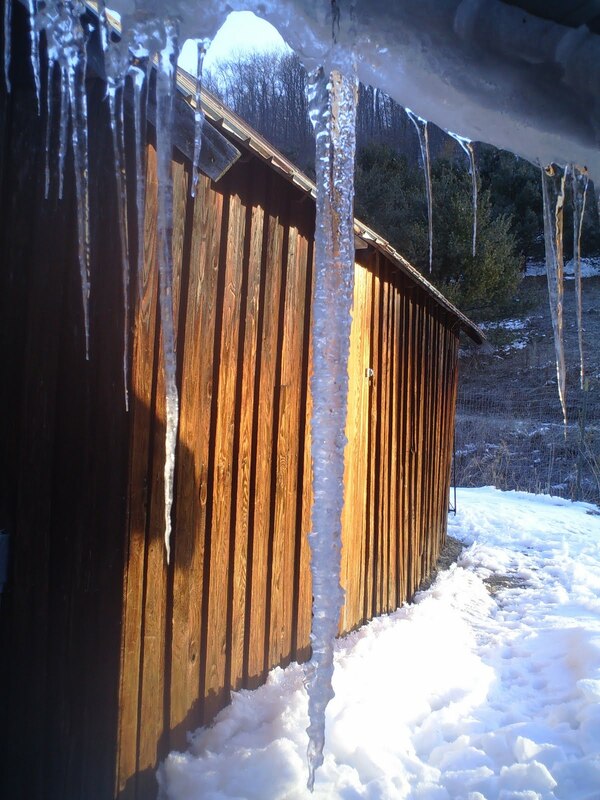 The last picture is just a cool icicle on our back porch roof. It is about three foot long. I had to knock it down so it didn't kill, Speck the Chihuahua on one of his trips outside. Lee Anne would never forgive me if I killed her dog while she was gone. 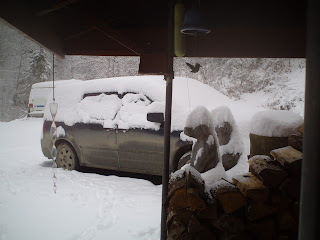 We got six inches of wet snow on the night of March 23rd. It covered the rest of the wood we were working on splitting and made running the wheelbarrow up the hill impossible. 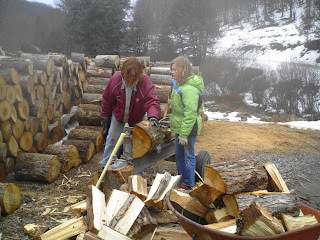 But my sister and I got a good pile of wood split. 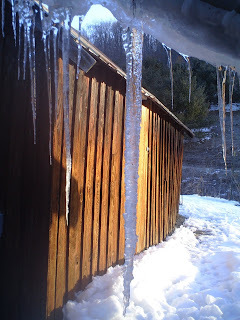 Most of the rest of the wood is buried in about 6" of ice and won't be coming out until we get warmer weather. The first picture shows split stack. The second picture is before we started yesterday. 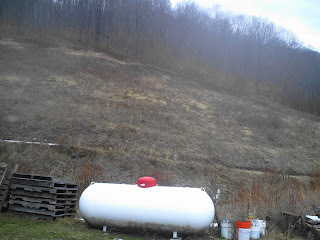 It was much colder than the day before and wet gloves and a breeze made hands and feet get cold a bit faster. look like much of the snow will melt until next Monday as the temperatures are going to drop into the low teens at night and stay below freezing for highs during the day. 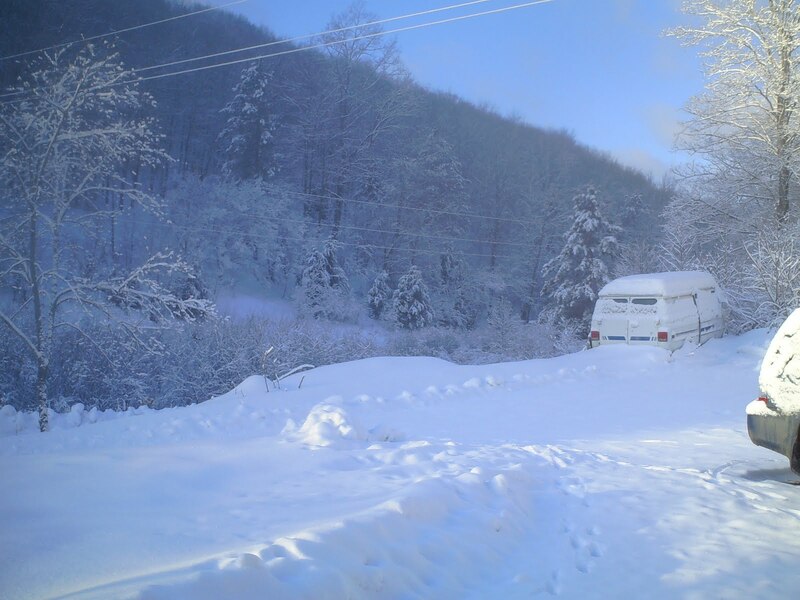 In the last picture you see my sister's van covered in snow. Fortunately, we didn't get anymore snow last night and with the road plowed she was able to get out over the mountain. I am formally putting the groundhog on notice. YOU ARE FIRED! That early spring you promised is not here! Mountain girl, Paula, logging out. 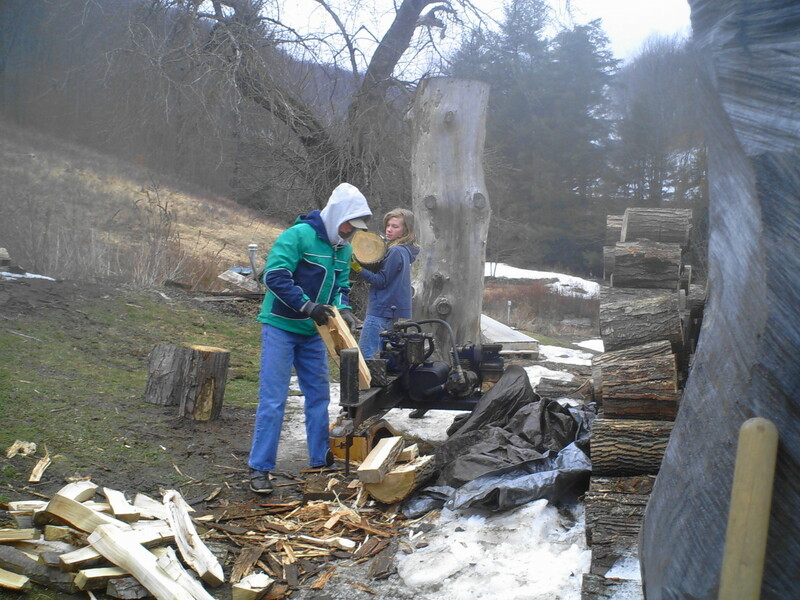 Splitting wood is a back breaking job even with a gas powered splitter. My sister Ruth, and three of her kids, Hunter, Abby and Hailey came up during their Spring Break to help. In two days, we have gotten about 6 cords of firewood split and stacked. The girls lasted about half the time we split wood, Hunter last for most of the time. 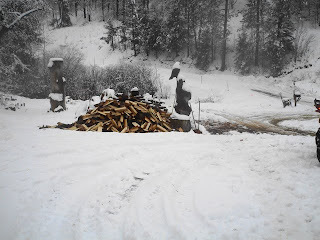 I don't think they realized how hard it would be and I hope will go home being thankful they don't have to heat with wood like their Aunt Paula. warning. They are calling for 6 inches of snow. So how much we get done. My sister is ten years younger than myself, but we found us both reaching for the Ibuprofens more than once. We did let the kids ride four wheelers around the property as they are prohibited in the State Forest as a reward for all their hard work. I wonder if they will be wanting to do this again next year? Mountain girl, Paula, logging off. The snow is melting quick and hopefully the roads will be clear soon. As you can see from the first picture the unplowed roads on north slopes still have about 6" of hard packed ice, slush and snow on them. 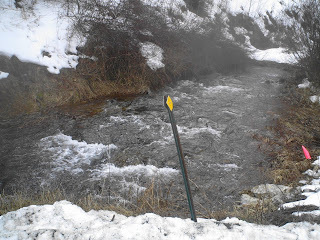 The warm day we had yesterday melted a lot of snow and the creeks are running full. 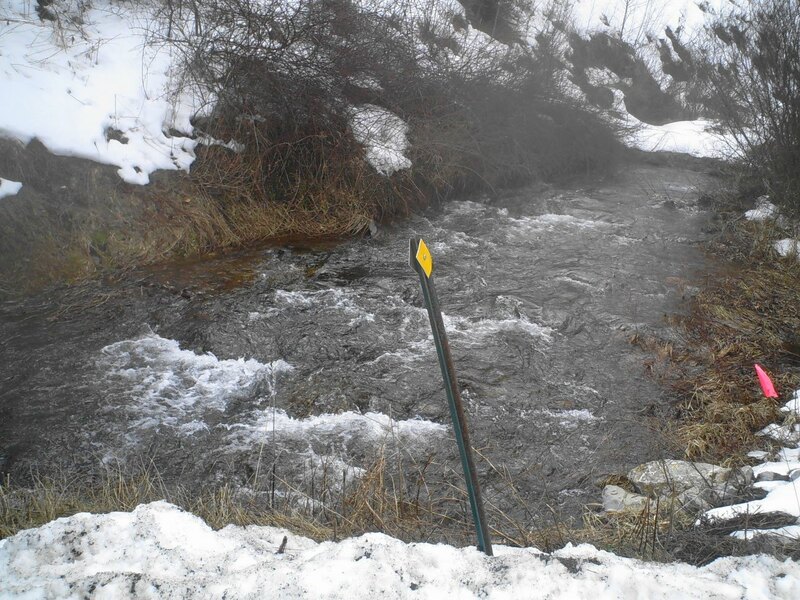 The second picture shows Buck Run a small creek in front of our house with the water running quickly. The sound of the water running this time of year is so loud it sound like a rainstorm. ground. 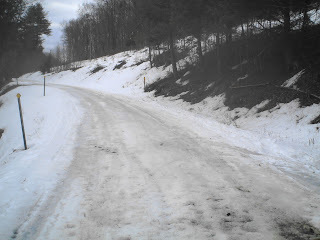 In places the snow has melted on the dirt roads the ground is heaving and it is common to run over large dips that come up suddenly. The ground is also soft during the day when it is above freezing and makes for slippery driving and muddy cars. The migrating birds are coming back as I have seen more Red Tail Hawks, blackbirds, geese and robins. Soon the vultures will return as well and some of the other songbirds. Most highs this coming week will be above freezing. I am giving the groundhog a failing grade for predicting an early Spring as we also have snow showers in the Thursday forecast. I am hoping we don't get a late frost this year as the animals really suffered through the winter with lack of acorns and many layers of snow and ice to dig through. Word to wise roads still tricky at best coming up from Cedar Run. I would wait for another week to make drive. There is definitely, a feeling of Spring about in the air and it has not come a moment to soon for the mountain girls. Mountain girl, Paula, logging out. I am back. It always feels good to get back in the mountains. It has been a hard week for me with the loss of my father and I thank all of you who sent sympathy my way it was appreciated. The snow did not cooperate while I was gone. Lee had several more inches of snow, two power outages, a phone outage and an internet outage. Lets face it she was out of everything last week. Fortunately, everything came back together this morning just before I got home. 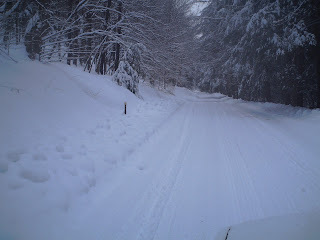 The roads are still very tricky where it is not plowed and I don't suggest driving on most of them. However, it does look like warm weather for the next ten days so maybe by the weekend things will be different. Now, I must get back into gear again and start working. Mountain girl, Paula, logging out. 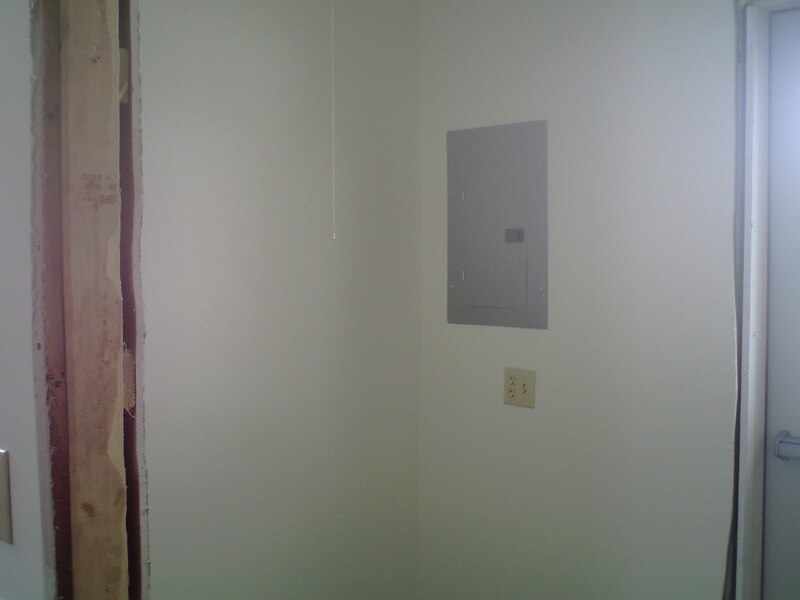 Well, the walls have been painted and most of the electrical circuits are up and working. 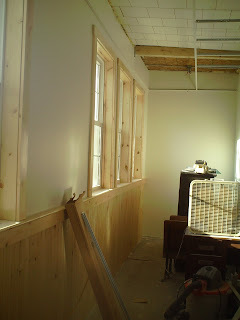 The tongue and groove boards and other pine boards for trim were delivered and I have routered the sill boards to get them ready to be varnished. Lee will be varnishing all the boards while I am gone for a week and then I will put them up when I get back. 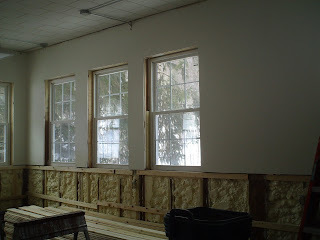 Trimming out the 10 windows and getting all the sills to line up will take the most time. 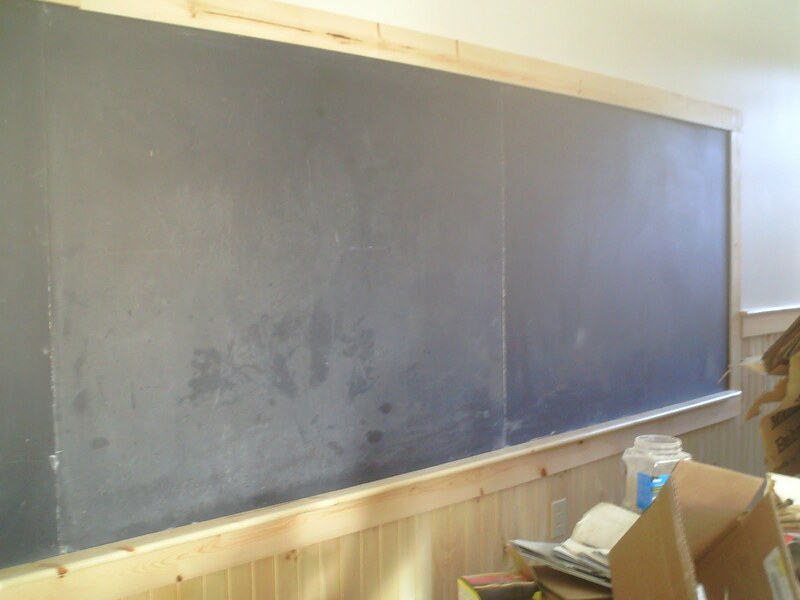 There is 900 linear feet of tongue and groove boards alone for Lee to varnish so she won't be bored while I am gone. You can see some of them in the second picture towards the bottom edge of picture. I had planned on getting all the trim boards sanded for her as well, but yesterday my father fell and hit his head on a ceramic floor while on vacation in Florida. He suffered a fatal brain bleed, so my day has been filled with other issues. I am the oldest of five children, my father is remarried so it causes a lot of issues to deal with in arrangements. Fortunately, my fathers wishes were:NO FUNERAL! He wanted a celebration of his life, which we are planning at a time when my siblings can get together from all over the country. He was almost 82 and had been getting very frail the last few years. And though you expect to lose someone that age, I didn't realize how much it would hurt. It is like part of you is gone and there is a big hole in your chest. I am glad I got to see him in January and keep the memory of him singing: "Too-ra-loo-ra-loo-ra and Irish Lullaby to me when I was young. I sat in the rocker he used to rock me and my kids to sleep singing this song last night when I realized he was moving on. I will miss my dad. Mountain girl, Paula, logging out. The last week of February was tough weather wise. We got hit with several snows. The first 12", then another 6", then another 6" rain and 4" more. We lost power twice during the period, but thankfully the power company got it back and running within about six hours using a track driven machine to get to the problem. 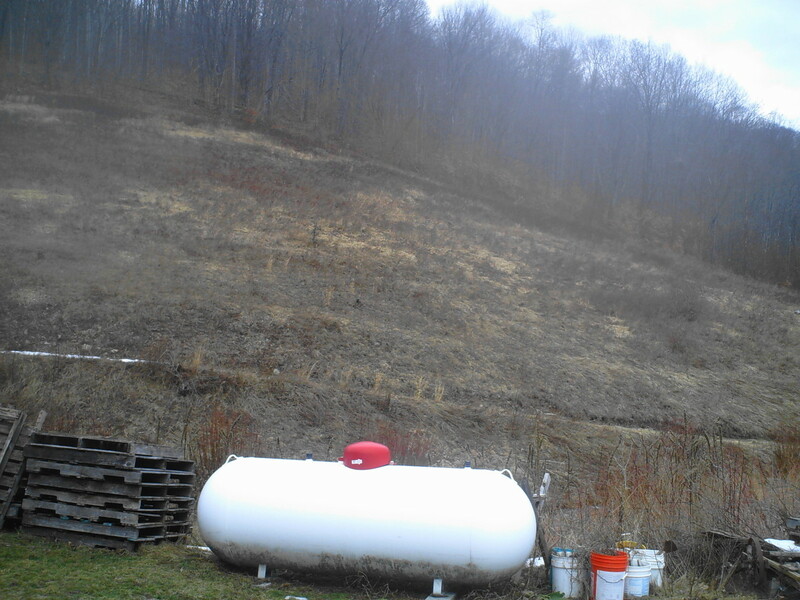 The first picture shows you what my back yard looks like. 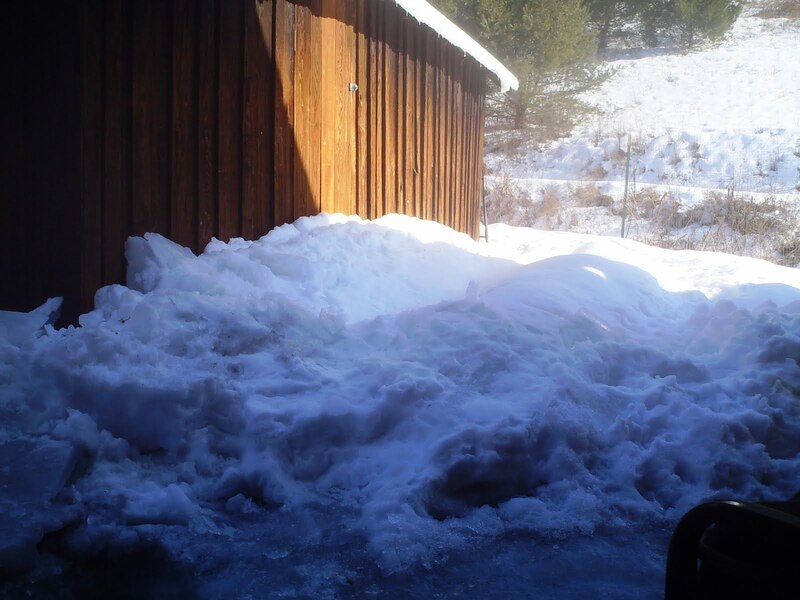 The snow is about 3 foot high from falling off the roof and piling up. 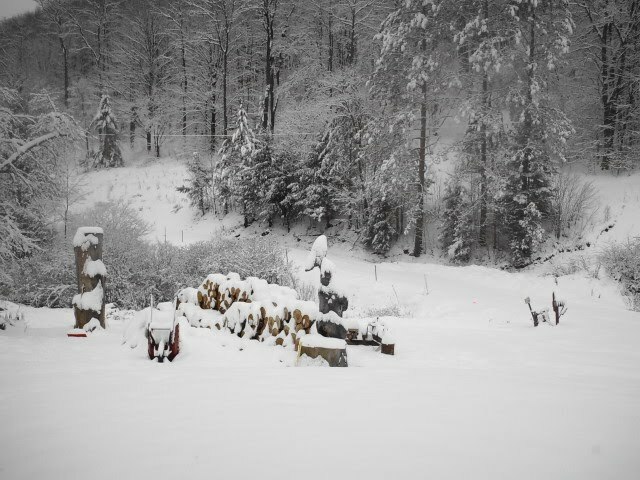 We had thunder, lightening and rain that took quite a bit of it off yesterday, but still has a good amount to melt. prettier if I could have stayed home to enjoy it instead of traveling on it. 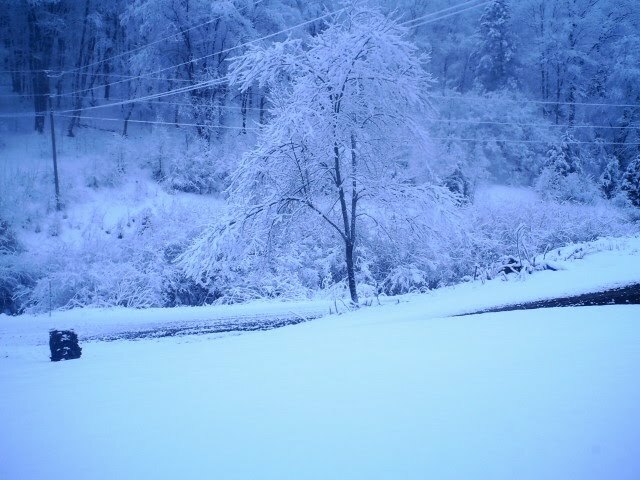 The last picture is right after the 4" snow the limbs hung heavy with snow and in the morning it gives you an icy feeling. This was taken as the sun came up and started to warm things up a bit. There is little room to move snow around and everyone is very tired of winter. Although, we aren't through with the chance of snow, March does give hope that spring is just around the corner. According to the Groundhog, Spring is supposed to be early. So, Spring get here already! Lee is helping me with the painting at the school house as I finished the drywall. 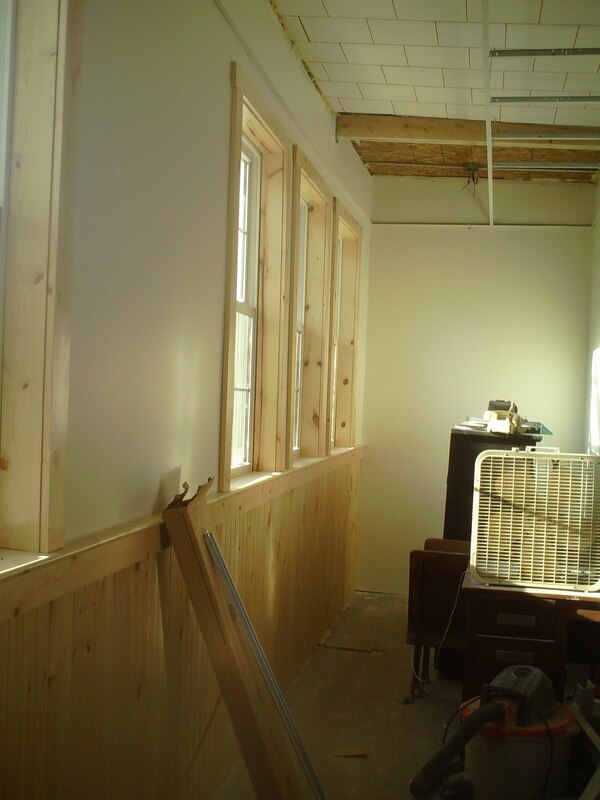 She will be varnishing all the wood to put up as wainscoting and the framing around the windows and doors. She will do most of this while I take a short run to Rockford, Illinois to help watch some grandkids for a week, while their parents are gone. It will be a rest from construction, but I can tell you keeping up with four kids is more tiring than any construction project. I have put in the order to Mother Nature to get rid of this snow while I am gone. Ha. Mountain girl, Paula, logging out.